This Engagement Session Norfolk Botanical Gardens is definitely a favorite. Not just the session but the couple as well! The two of them are young, but I was married at the age of 19 so who am I to talk??? Jacob and Brielle have such a fun and endearing kind of relationship. The way these two laugh and love one another is the sweetest thing to capture. Just a couple of years I took their pictures at Fort Monroe for their 2 year session. We had such a great time and who would have thought that we would be here just 2 years later shooting their engagement session. Brielle had a lot of vision when it came to their portrait session. She wanted something classy with lots of options. The Norfolk Botanical Gardens was the perfect location to bring her vision to life. We started in the Renaissance Hall which is one of my favorite locations. The stone stairs, the tall Italian cypress trees that line the walkway, and so much more. We nestled in and got started right away. Brielle’s dress/romper that she chose was absolutely perfect! She said she bought it from Francesca’s and I thought it looked absolutely amazing on her! I know I have said it before but it bears repeating… I love when our guys wear Navy. Jacob looked so handsome in his blue suit with pale pink bow tie. The day was sweltering hot. However, as hot as it was, we were all in good spirits and we had so much fun. I think we spent most of our time laughing. Especially at Jacob’s antics. I had them walk at one time along the flower beds in the hot direct sun. Instead of showing just how miserably hot it was, Jacob laughed and joked about the roses and had us all laughing and forgetting about the heat. These two lovebirds will be getting married next July at the Chrysler Museum in Norfolk. 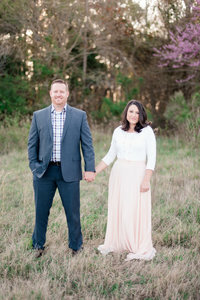 I love how their taste and vision for their engagement session will carry over to their wedding. The architecture and feel that the Norfolk Botanical Gardens offered will also be showcased at the museum. It is going to be a grand event! One thing I most excited about is seeing Brielle as a bride. This girl is absolutely stunning and I know she is going to make a gorgeous bride. I adore these two and it has been a joy watching their relationship grow and come together in a beautiful way. Thank-you future Mr. & Mrs. Pepper. I hope you enjoy some of our favorites. We love you guys! Killer Brielle! Jacob you need to have this framed somewhere to show off your beautiful Fiancé! I LOVE her ring! Great job Jacob! For these pictures and many others, Luke was holding shade right over them. It created soft perfect lighting. Last minute pictures by the wall before changing and I LOVE these! To book your portrait session with us, or to find out more about our wedding packages please don’t hesitate to contact us!